The Awards Season kicked off for animation fans has already kicked off with both the Emile and Annie Awards nominations already out. But in mainstream Hollywood, it's just getting started with the announcement of The Golden Globe nominations. The Golden Globes, awarded by the Hollywood Foreign Press Association are not known for taking chances in their Best Picture (Animated) Category. However, last year they surprised us by nominating two European independent features, even if Pixar inevitably won on the night with Coco. 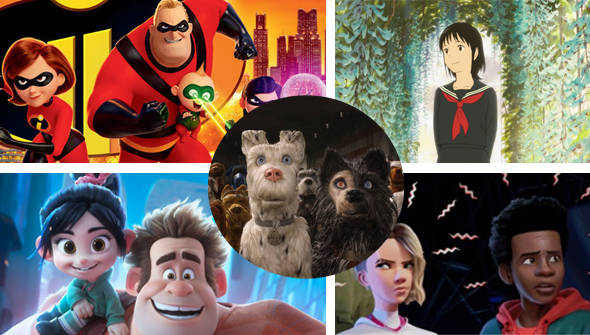 Pixar have to be favourites to win again this time, with Incredibles 2 scoring a nomination, alongside Disney's Ralph Breaks The Internet. If any film could potentially cause an upset, it could be fellow animated superhero movie Spider-Man: Into The Spider-Verse if early buzz is anything to go on. Stop-motion animation is represented this year with Wes Anderson's Isle of Dogs. The final nomination this year is this year's biggest surprise, Mamoru Hosoda's Mirai. It seems that at least in terms of nominations, the Globes are beginning to become a bit more adventurous. Mirai is an unusual nominee as both independent animation and 2D animation have been rarely nominated. It's also the first Japanese animation nominated full stop- not even Studio Ghibli has been able to get a nod from them before. Isle of Dogs is the only animated film to have scored a nomination elsewhere- earning a best score nomination for Alexandre Desplat. The 76th Golden Globes will be handed out on January 7, 2019. See the full list of nominations here.